The deepwater Patagonian toothfish (Dissostichus eleginoides)1 is a long-lived fish species (up to 55 years of age) with a low fecundity rate and slow growth, reaching its first sexual maturity at 5-8 years of age and full maturity between years 9-12. The Chilean Patagonian toothfish fishery is conducted by two commercial fleets: a small-scale fleet, and a fleet of larger industrial vessels. These fleets operate in two different, but adjacent, areas off the Chilean coast (Figure 1). Lemaitre et al. (1991) reports that the commercial fishery was initiated by the small-scale fishing fleet operating in waters of central Chile during the 1970s, and rapidly expanded to the south of the country due to the existence of fishing grounds with higher yields in that region. At present the small-scale fishery operates from the northern border of the country in Region I (18º15'S) to Region XI (47ºS). Its southern border is the limit of the fishing area reserved for the large-scale Patagonian toothfish fishery (Under-Secretariat for Fisheries 1999). Landings of Patagonian toothfish by the small-scale (artisanal) sector have continuously increased since the beginning of the fishery and reached approximately 6000t in 1986. Since then, the annual landings by this small-scale sector have fluctuated between 3300t and 5600t with a slight decreasing tendency towards the end of the 1990s (Figure 2). At present the official number of small-scale fishing boats operating in the fishery is approximately 120. They generate employment for approximately 900 fishermen and 400 people on shore (SERNAPESCA 1999). The industrial or large-scale, deep-water Patagonian toothfish fishery began in 1991 as a fishery that was managed under the RFID system ("Regime for Fisheries under Initial Development") [Pesquerías en Régimen de Desarrollo Incipiente] as defined by the Chilean Fisheries Act of 1991. The fishing area reserved for the large-scale fishery is shown in Figure 3. The northern limit of this fishing area is the parallel 47ºS, and the southern limit is the parallel 57ºS. The eastern boundary of the fishing area is the "straight baseline" 2 and the western boundary is the line drawn parallel and 70 nautical miles west of the baseline. The large-scale fishing fleet is comprised of 13 factory-vessels and 2 freezer-vessels. The entire fleet uses deepwater long-lines. Each of these vessels may fish, on average, a total of 10 000 hooks per set and the fleet operates some seven months a year in Chilean waters (January to May, and September to December). For the rest of the year (May to August) they operate in international waters. The large-scale fleet redirects its fishing effort to hake (Merluccius australis) from the beginning of January to mid-March of every year. This large-scale fishery employs a total of 520 fishermen plus another 150 personnel ashore. It is important to note that the large-scale fishing vessels not only operate in the reserved area depicted in Figure 3, but also outside the Chilean Extended Economic Zone (EEZ): off the coast of Argentinean Patagonia, the Malvinas or Falkland Islands, Southern Georgia and Kerguelén (Under-Secretariat for Fisheries 1999). Landings of Chilean Patagonian toothfish by the industrial or large-scale sector started in 1991 and they comprised catches taken both inside the Defined Fishery Area and outside the Chilean EEZ (here referred to as international waters). Peak landings of approximately 25 000t were obtained in 1991, after which landings by the large-scale sector have steadily decreased reaching a minimum in 1995 of approximately 5900t (Figure 2).3 From 1997 to 1999 a moderate recovery was observed in large-scale landings, reaching approximately 13 000t in 1999 (Figure 2). The total landings of the large-scale sector correspond to captures taken in international waters as well as in the Chilean Fishery Unit area (internal-EEZ between 47ºS and 57ºS). Landings taken in international waters have represented, on average, approximately 40% of total landings by the large-scale sector. Figure 4 shows that a peak was landed in 1992, which was mainly due to captures from international waters (approximately 16 800t). Afterwards, there was a dramatic drop in landings from international waters (85% decrease) between the years 1992 and 1994. From 1995 onwards, landings of Patagonian toothfish from international waters experienced a moderate increase, reaching approximately 5200t in 1999. Figure 4 also shows that the landings of Patagonian toothfish from the Chilean EEZ Fishery Unit [zone] followed a similar but lagging pattern to the landings from international waters. The peak for landings in the Chilean area was in 1994 (approximately 12 000t) with an 84% drop in 1996 when only 1992t of Patagonian toothfish were landed. Thereafter, the landings experienced a moderate increase, ranging around 4400t per year. Even though the fishing-effort in the large-scale sector increased by 100% from 1991 to 1998 (from approximately 4.0 million hooks per year in 1991 to 8.4 million hooks per year in 1998), the size of the fleet remained at around 15 vessels, after a drop of 58% in 1993. Simultaneously, the average yield per vessel (catch-per-unit-effort) decreased by 60%, falling from approximately 1.0 kg per hook in 1991 to 0.451 kg per hook in 1998. Approximately 99% of Patagonian toothfish landings are directed to processing and export markets. The statistics on Chilean seafood exports (Figure 5) show that the annual exports of Patagonian toothfish averaged approximately 15 000t during the period 1992 to 1999, 87% of it as frozen products. Patagonian toothfish export volumes showed an overall decreasing trend during this period, either as total volume of exports or frozen products. In fact, from 1992 to 1999 the total volume of Chilean Patagonian toothfish decreased by 14%, from approximately 13 780t in 1992 to 11 860t in 1999. Nonetheless, during the same period, the annual export value showed an impressive 80% increase: rising from approximately $US57 million in 1992 to $US104.5 million in 1999 (Figure 6). This increase was due to a strong increase in unit price, which grew 110% during this period, climbing from $US4200/t in 1992 to US$8800/t in 1999 (Figure 7). Japan is the most important foreign market for the toothfish fishery, taking 58% of the total volume of Chilean Patagonian toothfish exports. Frozen products represented approximately 82% of the FOB export value to Japan in 1998. The USA is the second most important foreign market for Chilean Patagonian toothfish exports, taking 27% of total export volume. Fresh refrigerated products represent 99.3% of the FOB export value in this market (Fisheries Export Statistics, unpublished data from the Customs Service of Chile and SERNAPESCA, the National Fisheries Institute, 1993 to 2000). As noted, from the legal, institutional and management perspective, the Chilean Patagonian toothfish fishery can be clearly divided into two types of activities operating under different management schemes: the small-scale fishery [Pesqueria Artesanal de Bacalao de profundidad] and the large-scale fishery [Pesqueria Industrial de Bacalao de profundidad]. The small-scale fishery is conducted north of the parallel 47ºS, and its two most important management regulations are: limits on boat-size (18m of overall length; MINECOM DS 43 and 439 of 1986), and gear restrictions (only deep water long-lines may be used with a limit of 12 000 hooks per cast; MINECOM DS 439 1986). No use- or property-rights are applied in this fishery, and it has been conducted under a quasi-open-access regime since its beginning. It is defined as quasi-open-access, because although almost anyone may enter the fishery, in order to do so, the small-scale fisherman and the boat must be registered in the "National Registry of Small-scale Fishermen" (or Non-industrial Registry).4 In 1999 this National Registry reported a total of 12 356 fishermen targeting the Chilean stock of deepwater Patagonian toothfish. At the same time, the Fisheries and Aquaculture Act 1991 had just been enacted, which included a number of new regulatory measures applicable to Chilean fisheries. Consequently, the Under-Secretariat for Fisheries (USF) decided to officially include the large-scale Patagonian toothfish fishery within one of the newly-created access-regimes, namely the ""Regime for Fisheries under Initial Development" (RFID) [Pesquerías en Régimen de Desarrollo Incipiente] (MINECOM DS 328, 1992), and in this way he established incentives leading to the achievement of a sustainable industrial Patagonian toothfish fishery. Article 40 of the Chilean Fisheries and Aquaculture Act [Ley General de Pesca y Acuicultura de 1991] states that in a fishery under this type of management regime, an annual total allowable catch (TAC) must be calculated by the Under-Secretariat for Fisheries and distributed among the eligible fishing companies or operators. In the large-scale Patagonian toothfish fishery, fishing- or harvesting-rights are allocated to fishing companies, and under the Chilean legislation are known as "Extra Fishing Permits" (EFPs) [Permisos Extraordinarios de Pesca]. These fishing-rights are divisible, transferable once a year, and can be leased or freely-lent (Article 31, 2nd Paragraph, Fisheries Act 1991). 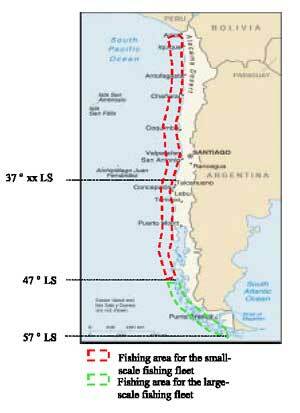 Even though this Act does not explicitly state it, under Chilean legislation these fishing-rights may also be banked. The establishment of a seasonal closure from 1 June to 31 August of every year between the parallels 53ºS and 57ºS (DS No. 273). Only trotlines or long-lines may be used to harvest Patagonian toothfish (Under-Secretariat for Fisheries, Res. 1249, 1992). Patagonian toothfish harvested as by-catch between the parallels 41º28,6'S and 57º00'S, may constitute only 2% in weight of the total harvest of southern hake or kingclip (MINECOM, DS No. 679, 1993). Articles 39 and 40 of the Chilean Fisheries Act 1991 state that, once a fishery has been specified under the RFID regulations, the Under-Secretariat for Fisheries is required to calculate an annual TAC which is to be allocated among fishing companies or operators by means of a public auction. Successful bidders will be issued an Extraordinary Fishing Permit (EFP) stating their right to harvest annually, for a 10-year period, a maximum amount of fish equivalent to the result of multiplying the corresponding TAC by the fraction that was awarded (i.e. the fraction of the TAC won in the auction by each bidder). These EFPs take effect as of the calendar year following the date that the auction was conducted. Therefore, under the RFID management system, EFPs auctioned for the first time have a designed initial lifetime of 10 years. But, the total number of EFPs that any particular operator may be awarded under this arrangement decreases by 10% each year.6 Thus, as of the second year of the RFID management system, only 10% of the TAC will be auctioned every year by means of Ordinary Annual Auctions. Fishing-rights or EFPs awarded at an Ordinary Annual Auction will have a lifetime of 10 years, but their amounts do not vary during their lifetime. Ordinary Annual Auctions are conducted starting from the second year that the RFID management system was set up. Special Auctions are conducted once a year, but they only involve those EFPs that are to be re-allocated, due to the failure of their holders to comply with the regulations of the fishery, or with the payment of the rent (which is paid in annuities). During a Special Auction the fishing-rights awarded will have a lifetime equivalent to the remaining lifetime that the EFP had at the moment its previous owner failed to comply and lost possession. Under the RFID management system, if at the time the system was put into effect there were fishing companies (or vessel-owners) holding valid fishing-authorizations for this particular fishery, they were entitled to continue their fishing activity as usual for an additional 3-year period. Upon expiry of this 3-year period, these fishing companies would be issued EFPs that note their right to harvest an amount of fish (expressed in tonnes) equivalent to a percentage of the corresponding TAC, calculated by dividing their average annual harvest by the average TAC during the previous 3-year period. These EFPs have a lifetime of 10 years, and their sum is equal to 10% of the TAC. Therefore, if there are valid fishing-authorizations at the time that the RFID system came into effect, the Under-Secretariat for Fisheries can award only 90% of the TAC during the first public auction. Otherwise, the Under-Secretariat for Fisheries must award the complete TAC at the First-Time Auction. Additional regulations governing the auction of EFPs and the allocation system are as follows. To be eligible to register in this special Registry, fishing companies or vessel-owners must present documents showing their legal property-rights or use-rights over the fishing vessel(s) that they designate to use the EFPs issued. Also, they must present documents describing the technical characteristics and the legal status of those fishing vessels. Bidders must present financial deposits as evidence of their bona fide commitment to bid in the public auction. No bidder may be awarded more than 50% of the TAC to be auctioned. The National Fisheries Service will open a Register of the EFPs for each fishery managed under the RFID system. This Register will record all EFPs issued against the TAC percentages awarded by auction, as well as all subsequent EFPs awarded following the division, transference or transmission, lease or free-lending of the rights. Three aspects should be highlighted regarding the process followed in designing and implementing the rights-allocation system: first, although no explicit policy objectives were set, the allocation-system designed by the Under-Secretariat for Fisheries aims at providing equal opportunity among bidders, and to avoid a monopoly in the market for fishing-rights in a fishery under a RFID management system. This system may also be seen as a way of preventing, or minimizing, complaints and conflicts among stakeholders. Second, since the fishery where the fishing-rights were allocated was new, no change in the fishery's structure or distribution was intended. Third, the allocation-system was designed by a small number of senior officers in the Under-Secretariat for Fisheries, and few changes have been made to what was originally proposed. The process of allocating fishing-rights requires the computation of at least three indicators to be taken into consideration by bidders. These are: the Floor Price [Precio Piso], the Bid Warranty [Garantia de Seriedad] and the Annuity Payment [Anualidades] 8 on every allocation awarded. The Decree No. 97 of 1996 containing the "Regulations for the Auction of Extraordinary Fishing Permits" lists the following data as the information required by auctioneers and bidders. The amount (tonnes) of the TAC determined by the Under-Secretariat for Fisheries. The Penalty Amount [Valor de Sanción] used to calculate the Bid Warranty which is to be deposited with the Under-Secretariat before the auction takes place. The number and type of allocations to be auctioned at a First-Time Auction, expressed as 10%, 5%, 2% and 1% of the TAC. If no original fishing-rights exist a total of 26 allocations would be auctioned. If any original fishing-rights exist, a total of 25 allocations would be auctioned. Table 1 shows the number of allocations per category in both cases. A number of fixed parameters used in the computation process for one or more of the previous indicators. The regulations for the allocation of fishing-rights (Decree No. 97, 1996) describe the conditions and computational process for the Annuity Payment and the Bid Warranty. The conditions and computational process for the calculation of the Floor Price are not described in these Regulations. Nonetheless, the officials of the Under-Secretariat for Fisheries use several methods for the calculation of these indicators. The Annuity corresponds to an annual payment [Anualidades] which bidders must make for the allocations that are awarded. This amount varies over time, depending on the remaining lifetime of each particular allocation, and its computation varies depending on the existence of historical fishing-rights and on the type of auction taking place (e.g. First-Time Auction, Ordinary Annual Auction, or Special Auction). The mathematical formulae used in these calculations are given in Appendix I, Section 1.3. Source: Elaborated from Decree No. 97, 1996. Article 16: the total amount of every bid awarded, expressed in Monthly Tax Units will be divided in ten equal amounts that must be paid in advance in December every year. Article 21: for all payment purposes, the total amount of every allotment awarded will be divided by a factor of 55, and the quotient will be multiplied respectively by 10, 9, 8, 7, 6, 5, 4, 3, 2 and 1 (i.e. totalling 55). Article 25: (when re-allocating fishing-rights) for all payment purposes, the total amount of every allotment awarded will be divided by as many annuities as number of years of remaining lifetime as the allocated fishing-right. Nevertheless, if these cuts are of a variable coefficient, the annuity calculation varies. Thus, each annuity will be calculated by dividing the total amount of the lot awarded by a factor equal to one-half multiplied by n (n + 1). In this case, "n" is the number of remaining years of effective operation of these fishing-rights. Finally, the annuity is calculated by multiplying the result of the first operation by each one of the remaining years of effective operation of the fishing-right, corresponding to its payment date. The effect of existing historic fishing-rights at the time of a First-Time Auction is that, for a period of three years, only a 90% of the TAC may be allocated by auction among fishing companies. Otherwise, no differences exist in the calculation process for the payment of fishing-rights awarded. The Floor Price is the minimum amount determined by officials of the Under-Secretariat for Fisheries that any particular bidder may bid for any particular lot to be auctioned. The calculation process for this indicator does not depend on the existence of historical fishing-rights. Nonetheless, the specific computation process to be used depends on whether the auction taking place is a First Time Auction, an Ordinary Annual Auction or a Special Auction. The mathematical formulae used for these calculations are shown in Appendix I, Section 2.
penalty amount related to operation of the fishery. The most common criterion used by the Chilean Under-Secretariat for Fisheries in a First-Time Auction is the Penalty Amount. In an Ordinary Annual Auction the Floor Price is calculated by officials in the Under-Secretariat for Fisheries, as directly related to the proportional change in the estimated TAC from previous years to the present period. For example, if the TAC (expressed in tonnes) increases by 10%, the Floor Price will also increase by 10% in the Monthly Tax Unit. In calculating the Floor Price for a Special Auction the officials in the Under-Secretariat for Fisheries consider the Floor Price from the previous period (year), and the expectancy of cuts to be made in the harvest, based on their remaining lifetime at the moment of the Special Auction. The above is based on the fact that the harvest-expectancy of any allocation varies over time. Further, the size of the variation in the harvest-expectancy of a specific allocation awarded at a Special Auction depends on whether it was originally awarded in a First-Time Auction or in an Ordinary Annual Auction. Thus, portions originally awarded in a First Time Auction are seen as having a decreasing harvest-expectancy, while portions awarded in an Ordinary Annual Auction have a constant harvest-expectancy. The "Bid Warranty" is an indemnity in favor of the Management Agency and intended to ensure the intention and commitment of any particular bidder to honor the payment due for any allocations awarded. This payment may be presented in cash or as a bankable document. The amount of this payment does not depend on the existence of historical fishing-rights. According to Article 12 of the Regulations governing this allocation system (Decree No. 97 of 1996) the sum of money to be deposited with the Under-Secretariat for Fisheries as a "Bid Warranty" for any allocations that an individual hopes to be awarded, is calculated by multiplying the percentage of the portion to be awarded by the TAC to be auctioned, the Penalty Amount for the resource, the Monthly Tax Unit for the date of the auction, and a Fixed Coefficient to be established in the terms of reference for that particular auction. The mathematical formulae used in these calculations are shown in Appendix I, Section 3. According to the Under-Secretariat for Fisheries there have been no problems of data quality, availability or analysis that have hindered the allocation-process for fishing-rights or Extra Fishing Permits (EFPs). The Department responsible for data collection and analysis is the Under-Secretariat for Fisheries. No external technical assistance has been needed to perform the computational processes required to calculate the variables used in the auction process. According to the Fisheries Act, all fishing-rights are allocated by the Under-Secretariat for Fisheries. Only the auction process in itself requires outside technical assistance - a professional and registered auctioneer is hired especially for this. The auction process must be directed and overseen by the Under-Secretary for Fisheries in person, with a small team of assistants. It is also important to stress that the allocation and management processes for the fishery units/zones under the RFID system have been conducted within the existing budget of the Under-Secretariat for Fisheries: no additional or special funds have been necessary to date. Finally, the Regulations regarding the fishing-rights allocation-process (Decree No. 97, 1996) do not explicitly state any conditions or processes for anyone to appeal the process regarding the allocations received, and no legal appeals have occurred to date in this fishery. Three aspects should be considered in evaluating the initial allocation-process in this fishery: (a) the level of success in achieving initial policy objectives; (b) the satisfaction of rights-holders with the system and the process in place; and (c) the views of other community groups. Officials of the Under-Secretariat for Fisheries feel that at present there is not sufficient scientific or practical evidence to show whether (or not) the Chilean Patagonian toothfish fishery has yet reached sustainable levels. However, they are convinced that the RFID management system has turned this fishery in one of the best-regulated fisheries in the country. The level of satisfaction (or dissatisfaction) of rights-holders with respect to fishing-rights and the allocation-process set up in this fishery was determined through interviews by telephone with three important fishing-company managers. The landings by these three companies surveyed represent approximately 77% of the present TAC. The extent of the rights-holders' satisfaction was surveyed with respect to three specific aspects of the system: (a) the allocation mechanism and process in itself; (b) the economic output of the activity; and (c) the efficiency of the enforcement system in place for the fishery. Those interviewed were asked to consider their initial and present perception of this system. The general perception was that system in place has been adequate, but that it now requires some improvements. The system was perceived as adequate for three main reasons: first, there was general agreement that payment for fishing-rights brings a clear sense of ownership (even though temporary) over the portion of the resource available for harvest. This applies not only to the quota-holder, but most importantly, also to third parties or operators. Second, the system gives fishing companies, or operators, the freedom to regulate their activities over time, according to their own efficiency-criteria, by allowing them to focus their fishing during those periods of the year when fish are abundant, and operating costs and market prices are most favorable (i.e they can generate the largest net-benefit). Third, the lifetime of ten years attributed to the fishing-rights is considered by the fishing operators to be an adequate time-horizon for economic and financial planning, as well as being consistent with a medium- to long-term commitment towards resource (stock) sustainability. The system is also considered to be capable of improvement, based on the grounds of equity and efficiency. Desired improvements on the grounds of equity relate to the initial-allocation mechanisms, and to the maximum percentage of the TAC that a single operator or fishing company may hold over time. The initial-allocation system for the fishing unit/zone [Unidad de Pesqueria] is based on the existence of historical-rights corresponding to 10% of the TAC that was to be allocated among fishing companies or operators holding valid fishing-permits at the time the RFID system was set up. This system is perceived as unfair because some operators obtained fishing-rights for free, which they could sell at any time, thus capturing benefits for no cost. Furthermore, some respondents stressed the need for mechanisms to regulate the percentage of the TAC that a fishing company or operator may hold, but based on their differences in operational capacity. Some operators are able to operate on fishing grounds both inside and outside the Chilean EEZ, while other smaller companies can only operate within the Chilean fishing areas. Some argue that the larger operators have better opportunities to obtain their harvest-quota than do those who can only operate inside the fishing units/zones. Thus, there is the perception that the smaller operators should have had a preference with respect to the percentage of the TAC that they may hold and in this way, the differences in harvest-opportunities would be more balanced. Desired improvements on the grounds of efficiency are aimed at improving the present method of quota-allocations, specifically, with respect to the open-bid system, the level of the Bid Warranty required, and the virtual lack of any barriers to quitting the fishery. The perceived problem is that with the present operating situation, the open-bid system tends to raise the prices paid for fishing-rights beyond the actual value of the resource. It is claimed that the allocation-system creates incentives for fishing operators to enter the fishery and excessively exploit the resources in the short-term. This argument is based on the fact that the present low level of the Bid Warranty (which is initially set based upon the Penalty Amount), and the non-existence of barriers to quitting the fishery, stimulate a rise in the prices that are bid. Thus, a proposed improvement would be to use a system of secret bidding, to raise the value of the Bid Warranty, and to introduce some penalties (presumably economic) for quitting the fishery before the expiry of the lifetime of the fishing-rights that have been awarded. One general perception among those interviewed was that the RFID system results in better economic outputs, than under a global-quota or a competitive TAC (Total Allowable Catch) system. Support for this view is that the system of individual fishing-rights creates incentives to regulate fishing-effort and fishing-harvest throughout the year. Thus, the fishing companies or operators are able to direct their fishing effort to those periods of the year when fishing-effort is most profitable (i.e. when costs are minimal and/or net-benefits are maximized). In contrast, under a system of global-quotas there are incentives to exert as much fishing-effort as possible in the shortest possible time, so as to harvest as much as possible of the common quota (i.e. gold-rush behavior). These conditions lead in turn to fishing-costs that are higher than desirable (although not all the operators share this view, nor do they perceive any difference between a system of individual catch-quotas and a system with global-quota). There were different perceptions about the efficiency of enforcement in the fishery, ranging from those who believed that there are no enforcement problems, to those who believed that there is mis-reporting with respect to the quantities of catches at sea (factory-vessels) and the location of harvesting operations (catches outside the limits of the fishing-area). At the same time, there was agreement that, in spite of the fact that the personnel of the National Fisheries Service make their best effort to conduct enforcement, this Service suffers a lack of proper infrastructure and equipment, as well as a shortage of personnel in its regional offices. There was also a recognition that the new regulation regarding the mandatory use of a Vessel Monitoring System (VMS) for marking the position of every vessel at any time, should correct the problem of harvesting operations taking place outside the limits of the fishing-areas. Some operators argue that the observed differences in the declarations of on-board production, is a minor problem originating from the existing working conditions at sea, and the lack of precision of the instruments in use. This problem is however believed to be corrected at the time of the landings, when it is necessary to check the catches and provide production statistics. There is a general perception that enforcement is a key factor for the RFID system to be successful. Some operators expressed the need for a stronger link between the collection of scientific data, and enforcement activities, especially, with respect to the determination of the annual TAC values (e.g. 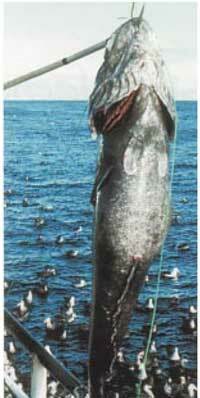 consideration of the effect of large marine mammals on catches and available biomass). There was a general perception among many members of the small-scale fisheries sector that the system of allocating individual harvest-quotas (transferable or not) has been devised so as to favor the larger and richer operators, because the system is viewed as a continuation of the privatization of the country's natural resources that mainly occurred in the mid-1970s and through the 1980s. Four aspects relating to the implementation of the RFID management system merit comment: (a) its ability to preclude monopoly; (b) consideration of the economic value of the natural resource; (c) the computational process of the Floor Price used for auction purposes; and (d) general equity issues. The fishing-rights allocation-system presently in use ensures that no operator can have access to more than 50% of the TAC through successful bids at auctions (First-Time Auction or Ordinary Annual Auction). Nonetheless, this limit in itself may not be completely effective in precluding the development of a monopoly and concentration of capital among the fishing units, because it is possible for an operator to hold more than 50% of the TAC by acquiring fishing-rights at a Special Auction or through market transactions by lease or sale. During the time that the RFID management system has been in effect in the Patagonian toothfish fishery, a significant quantity of fishing rights (EFPs) have been transferred internally by means of sale, rental or free-loans. The request by operators for a mechanism to regulate the maximum amount of the TAC that any company may hold at a time, is consistent with the above situation. However in this context, it is important to note that the government, private companies or individuals could already take action against a monopoly of this type in the fishery by resorting to the Anti-Monopoly Law (SD 219.610 of 1999). As presently implemented the RFID management system in effect in the Chilean Patagonian toothfish fishery does not ensure the sustainability of the fishery under any particular conditions of economic or social efficiency. On the one hand, there is scientific evidence that the targeted stock under consideration is affected by migration (both in and out) and therefore that the stock is not only affected by the fishing-effort of the large-scale fleet - there is more than one fleet exerting fishing pressure on same fishery resource: - the small-scale fleet; the large-scale fleet; and the international fleets operating in international waters. These fleets all operate under different management regimes, and therefore there is no coordinated constraint on the harvesting of the resource. This may outweigh any positive impact that the RFID system may have on the stock abundance over time. This constraint may negatively affect the efficiency of the RFID system in preventing resource-rent dissipation and thus preventing a better distribution of the potential benefits (rents) to society from the exploitation of this resource. On the other hand, the present mechanisms in the RFID procedures for the way in which fishing-rights (i.e. Extra Fishing Permits) are awarded to fishing companies, do not necessarily reflect the real economic value, or the opportunity-cost of the resource to society. This assertion implies a normative concept, i.e. that fisheries management should aim at ensuring the best possible use of the fisheries resources over time from a social and economic point of view, consistent with ensuring the sustainability of the resource. This implies an objective for fisheries economists and natural resource economists: that of managing fisheries to achieve a fishing-capacity (capital, fishing effort and harvest) that maximizes the present net-value in the flow of benefits to be accrued by society from the fishery over time. To do otherwise, would mean forgoing benefits and thus overlook the real opportunity-cost of fishery resources to society. In this context, in the system for allocation of individual fishing-rights through auctions, it is expected that society will set limits on harvest-levels (i.e. TACs) so as to achieve the maximum net-benefits. It is also expected that society will recover resource opportunity costs through the requirement of payment for fishing rights awarded to interested parties (i.e. fishing companies, operators and/or simply fishermen). One way of ensuring that payments for fishing-rights properly capture the opportunity-cost of the resource is to set the minimum bidding amount equal to the value of that opportunity-cost. Nonetheless, to do this requires an estimate of this value in advance through an ex ante bio-economic evaluation. Such calculations require a number of assumptions and approximations to actual conditions (resources, markets, social conditions, etc.). One should high-light two aspects of the present RFID system that may generate problems that could prevent the best possible use of the resource of Patagonian toothfish. The first one is that at present the harvest-level, or TAC, is set according to biological criteria that will not necessarily lead to the maximization of net-benefits over time. The second is that at present the minimum bid for fishing-rights, or the Floor Price, is set equal to the Penalty Amount for this resource, which is determined using different criteria to those used for the opportunity-cost of the resource. Therefore, proper adjustments should be made in the present RFID management system so as to better consider the economic value of the resource if a sustainable, economic and socially efficient fishery is desired. Members of the fishing industry claim that higher minimum values for the Bid Warranties, and the introduction of some penalty mechanisms for quitting the fishery, would improve this situation. In addition to the problems mentioned above, the computational process for adjusting the value of the Floor Price over time seems to be inconsistent for reflecting the changes in the value of a relatively scarce natural resource over time. In fact, the computational process for the Floor Price in an Ordinary Annual Auction or a Special Auction implies a direct relationship between the amount of fish to be allocated (i.e. the variation in the volume of fish in the TAC considered over time) and the variation of the Floor Price. That is, if the TAC and the amount of fish to be allocated increase, the Floor Price also increases. On the contrary, if the TAC and the amount of fish to be allocated decrease, the Floor Price decreases. Clearly, this is opposite to the behavior of prices related to the supply and demand of scarce commodities under normal market conditions. Thus, the mechanism used to calculate the Floor Price for auction purposes should be adjusted to properly reflect the behavior of the economic value of scarce resources over time. Otherwise society, represented by its Government, is forgoing revenues and benefits which could be obtained from the efficient use of its natural resources. Finally, it is important to bear in mind, that the proper setting of a Floor Price to values reflecting the opportunity-cost of the resource (i.e. its value in the water) may play the central role in determining the appropriate rental to be paid by rights-holders, if proper adjustment of possible inequities is to be achieved. Although efficiency objectives and criteria are central to fisheries management if the achievement of sustainable development is desired, equity objectives and criteria are also important to consider when designing and implementing systems of individual transferable quotas (ITQs). One relevant issue in designing initial-allocation mechanisms is the financial and economic capacity of a sector, such as the small-scale or artisanal fisheries sector. Another relevant issue in any particular fishery is the potential concentration of capital and economic power that can arise from the existence of a system of ITQs, which may lead to a monopoly if there are no restrictions on the concentration of harvesting-rights by a single operator. The real social impact of these issues will depend on what a country and/or a society considers to be an equitable situation. The authors wish to thank Mr. Francisco Ponce from the Chilean Under-Secretariat for Fisheries, for the sharing of his thorough knowledge and understanding of the historic evolution of this fishery and the fisheries regulations in Chile. We are also thankful to the many persons in the private sector who kindly received our inquiries and answered them with a sound understanding of the practical and theoretical aspects of this management system. Government of Chile 1991. General Law of Fisheries and Aquaculture. SD No. 430. Santiago: Official Gazette of the Republic of Chile. Government of Chile 1996. Regulations for the Auction of Extraordinary Fishing Permits. SD. No. 97. Santiago: Official Gazette of the Republic of Chile. Lemaitre, C., P.S. Rubilar, P. Gebauer, and C.A. Moreno 1991. Regional Catch Analysis of Long-line Fisheries of Dissostichus eleginoides in Chile. Document WG-FSA-91/10 CCAMLR, Hobart, Australia. 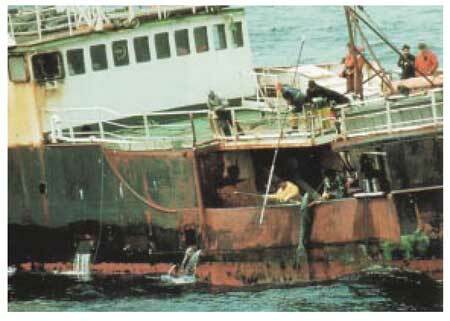 SERNAPESCA (National Fisheries Service) 1999. Registry of Artisanal Fishermen of Chile. Ministry of Economy, Santiago. 67. Fishery Resources Department, Ministry of Economy, Valparaíso. Computational process for relevant auction indicators. To calculate the Annuity Payments (AP) to be made by a successful bidder it is necessary to know the percentage of the TAC awarded to him or her at different auctions, as well as the total value paid for these allocations awarded. These calculations depend upon whether the TAC percentages already existed or not, and whether there were historic fishing-rights at the date of the First-Time Auction. Equation 1 shows the mathematical expression used to calculate the percentage of the TAC awarded to any operator at a First-Time Auction or Ordinary Annual Auction, and in effect at the time of analysis. i = subscript expressing the ith type of cut (expressed as a % of the TAC) awarded to a particular operator. At a First-Time Auction the subscript "i" is a vector assuming the values 1%, 2%, 5% and 10% (see Table 1), and at an Ordinary Annual Auction the sub-index "i" is a constant equal to 1%. QAa,t,I = percentage of the TAC awarded at the ath auction for the ith type of cut and in effect operating in the tth time interval. ja,I = subscript expressing the number of cuts of the ith type, awarded by any operator at the ath auction. The variable "j" may be equal to, or greater than zero (0), and lower than, or equal to, the maximum number of cuts of the ith type as defined by the Regulations of the RFID management system. FACt,a = an auxiliary variable used to calculate the proportion of the cut awarded at the ath auction that is in effect operating at the tth time interval. ata = year the ath auction takes place. QAa,t,i = percentage of the TAC awarded at the ath Special Auction for the ith type of allocation in effect in the tth time interval. sja,i = subscript expressing the number of cuts of the ith type, awarded by any operator at the ath Special Auction. The variable "sj" may be equal to or greater than zero and lower than or equal to the maximum number of allocations of the ith type as defined by the regulations of the RFID management system. SFACt,a = auxiliary variable used to calculate the proportion of allocation awarded at the ath auction that is in effect at the tth time interval. sata = year the ath the Special Auction takes place. Thus, the total percentage of a TAC awarded by any operator and in effect at the tth time interval may be expressed as in equation 3. TQAt = total percentage of the TAC awarded by to any operator at a First Time Auction, Ordinary Annual Auction,or Special Auction, and in effect at the tth time interval. All other variables, parameters and constants are as previously defined. The value of the quantity of fish awarded by any individual at the ath auction may be expressed as in equations 4 and 5. TACa = total allowable quantity (tonnes) of fish harvest to be allocated among operators at the ath First-Time Auction or Ordinary Annual Auction. TACa = total allowable catch (tonnes) to be allocated among operators at the ath Special Auction. The calculation process used to determine the value of the annuity payment of a First-Time Auction or Ordinary Annual Auction is expressed in Equation 6. Where all variables, parameters and constants are as previously defined. The calculation process to determine the value of the annuity payment of a Special Auction may be expressed as in equation 7. Where all variables, parameters and constants are as previously defined. Thus, the total annuity payment to be made by any operator at the tth time interval may be expressed as in equation 8. TANt = amount of monthly tax unit to be paid as an annuity by any operator at the tth time interval. To consider the existence of historic fishing-rights during the first three years of the RFID management system, the calculation process must consider only 90% of the TAC to be allocated in a First-Time Auction until the third year. Afterwards, 100% of the TAC must be considered. Since the above variations affect the fishing unit/zone as a whole, these differences will not be reflected in the mathematical expressions used above to estimate the required indicators. The Under-Secretariat for Fisheries uses different formulae in calculating the Floor Price to bid for fishing-rights, depending on whether the auction taking place is a First-Time Auction, an Ordinary Annual Auction, or a Special Auction. The calculations shown below are for an Ordinary Annual Auction and a Special Auction only. In an Ordinary Annual Auction the Floor Price is calculated according to the proportional change in the TAC allocated from year to the next. Equation 9 shows the mathematical expression used by Under-Secretariat for Fisheries to calculate this. TACa-1 = total allowable catch allocated at the previous auction. E = harvest-expectancy of the cut to be auctioned, expressed as a % the TAC to be allocated among operators. In turn, the calculation of E varies depending on whether the Special Auction refers to a First-Time Auction, or variable cuts, or to an Ordinary Annual Auction, or fixed cuts. Equation 11, shows the mathematical expression used by Under-Secretariat for Fisheries to calculate E for fixed cuts to be auctioned. Ei = expected harvest (% of the TAC) to be obtained from the remaining lifetime of the ith fixed cut. Equation 12 shows the mathematical expression used by the Under-Secretariat for Fisheries to calculate E for variable cuts to be auctioned. sat5 = time interval at which the ath Special Auction takes place for variable cuts. FAC2a,i = auxiliary variable to account the ith type of variable cut actually awarded at the ath Special Auction. FIXCa = fixed coefficient to be applied to the TAC in order to calculate the Bid Warranty at the ath auction. This coefficient is to be determined by the Under-Secretariat for Fisheries. 1 The Chilean common name for this species is Bacalao de profundidad which is sometimes translated as "cod". Another common name in Spanish is Austromerluza negra. 2 The "straight baseline" is the hypothetical straight line drawn between the most seaward points of the coastal of the country, which is used as a geographical reference for fisheries management purposes. 3 This peak in landings was generated through research fishing in 1992, which produced large catches. 4 The National Registry of Small-scale Fishermen is a record kept by the National Fisheries Service, containing a list of people authorized to conduct small-scale fishing activities in Chilean waters. 5 Re-allocation of Extraordinary Fishing Permits (EFPs) is required whenever a fishermen or operator fails to abide with the regulations of the fishery, or with the payment for its fishing-rights. 6 That is, the first time successful bidders will be issued Extraordinary Fishing Permits (EFPs) with a variable coefficient. This variable coefficient will decrease by 10% each year until the expiry of the lifetime of the share awarded. Thus, the owner of these first-time fishing rights will have in the first year, the right to fish 100% of the share awarded, 90% of it the second year, 80% of it the third year and so on, until the lifetime of the first-time fishing rights expires. 7 The National Industrial Fishing Registry is a record kept by the National Fisheries Service containing a list of people authorized to conduct industrial or large-scale fishing activities. 8 Note - this payment is equal to the bid for the entire 10 year period divided by 10 - there is no allowance for any interest that may be due. 9 A real monetary-value or real price is an indicator that has been corrected to reflect the change in the value of money over time due to economic inflation or deflation.